COME ONE, COME ALL, BE YOU OLD YOUNG, OR SMALL (TALL TOO)! A PACKAGE OF HAPPINESS !!!!! SOMETHING THAT HAS MADE YOU HAPPY!! 2 OF YOU CAN WIN! Something that has made me happy, I shall say my little boy! Not much of a story here.. but.. He can be a little rascal sometimes but he never fails to make me laugh and smile He relies on me and I will be there for him no matter what, he's a very clever boy and I love him lots. A few years ago (when Lost was still on the air) my mom was taking some photos of the plastic billboards on the buses for season 2 (or 3) of Lost (the one with the Losties and the Others in the forest). The bus driver asked what she was doing (I was in the parks at the time) and she said that I was a big fan of the show. I think she inquired if there was a way to get one of the little billboards and the driver said no but asked for our hotel information. The next day, we had received a package and it was one of the billboards from the bus. I was completely shocked and it made my entire trip. I was very protective of it and took it home on the plane with me. I still have it to this day and I imagine it would be a unique collectible (especially if I had ever managed to get the cast to sign it). It is something I will always cherish and I know it is something that not everyone has. I only wish I had met the driver to say thank you. Two lovely stories so far!!!!!! Wow! What an amazing gift to be surprised with!!!!!! And snow you must have too many wonderful stories to pick only one!!!!!! I think my happy story would be more of a funny one.... it makes me laugh every time I think about it. I was in London on our final Girl Scout trip (They call them Girl Guides in Europe). We had a tour guide named Joslyn (a short, balding, man in his late 40s) and a bus driver named Everett. We were all standing around in a group, and I was somehow standing in front of everyone else. Joslyn asked who wanted to go tour St. Mary's Cathedral and who wanted to go shopping. In love with the architecture, I raised my hand for St. Mary's. Apparently I was the only one, because the next thing I knew, I was being whisked away from my group by Joslyn, who said we had to hurry before the tour closed. We got to the gates of St. Mary's and we had just missed their "open to the public" hours. So, Joslyn decided that he wanted a pint. We went into this shoddy little pub, where he proceeded to offer me a beer. I was only 17 at the time (which apparently didn't matter), plus I had no interest in drinking. So there I sat, on a pub stool, watching Joslyn slam down a pint. As he went to the loo, I sat there like a tourist... camera around my neck and everything.... this old drunk man in the corner started shouting obscenities at me saying, "Americans with their cameras...." Joslyn got out of the loo, tipped the barman and we traveled back to the bus. It was uncomfortable, irritating, and weird at the time... but now, it's HILARIOUS... I'm even smiling while I type this. It's a story I will never forget... it makes me giggle... and giggling makes me happy. Of course it counts, made us chuckle and smile which is what these stories are all about! Bump, I would love to hear some more stories. Guys it's FREE things! For telling stories! [knucklecrack] Here comes the full WDW engagement story. Three days before our departure, Nicole called me and announced she'd be asking Liz to marry her down at Epcot. Now, Dan and I had been living together and dating for two years, and I was kiiind of starting to think that this would be THE trip where something would happen. But since Nicole had called to tell me all of this, I decided it wasn't our time -- no way two engagements would happen at Disney on the same trip. So, I helped Nicole plan her engagement and that was that. We were going for the EPCOT 30th celebrations and MNSSHP. As a costume designer, I jumped at the chance to make a costume, and at the very last minute, Dan decided he wanted a Flynn Rider costume to match my park-friendly Rapunzel. I stayed up all night before we left to make him a costume for the party, and he specifically reminded me to be sure the satchel was packed with his costume. We get to the resort and get into costume and head into the parks. I asked Dan if he could hold onto my sunglasses, and he go very defensive and agitated when I tried to put things in the satchel. The party is great, everyone's having fun, but Dan seems distracted. Since it was our travel day, he passed it off as just being tired. About half way through the day, I get a text from my cousin Nic, who is one of my best friends. She asks, "Have you met Rapunzel yet?" and I text her back with, "Um. No. Why?" She doesn't respond. She later plays it off as a dead phone battery. We enjoy ourselves, ride a ton of rides, eat a ton of candy, and go home for the night. Dan still doesn't let me touch the satchel. The next morning, we wake up bright and early to go back to the Magic Kingdom for the opening show. Somehow, the topic of jewelry comes up, and Liz very offhandedly says something about how much I love white gold. I asked her how she knew that, and Nicole started flipping out at her to stop talking. We watch the show, I cry as I tend to, and we head into the park. We got up to Town Hall and I asked the group if they would mind if we went to check and see which Princesses were there for photos. Since it was so early, we were the first in line. While we were waiting for the Town Hall doors to open, everyone descends upon me, primping my hair, taking my sunglasses and holding my purse. It was incredibly strange, because no one would tell me why. Eventually, the doors open, and they shove me forward to meet my homegirl Rapunzel. 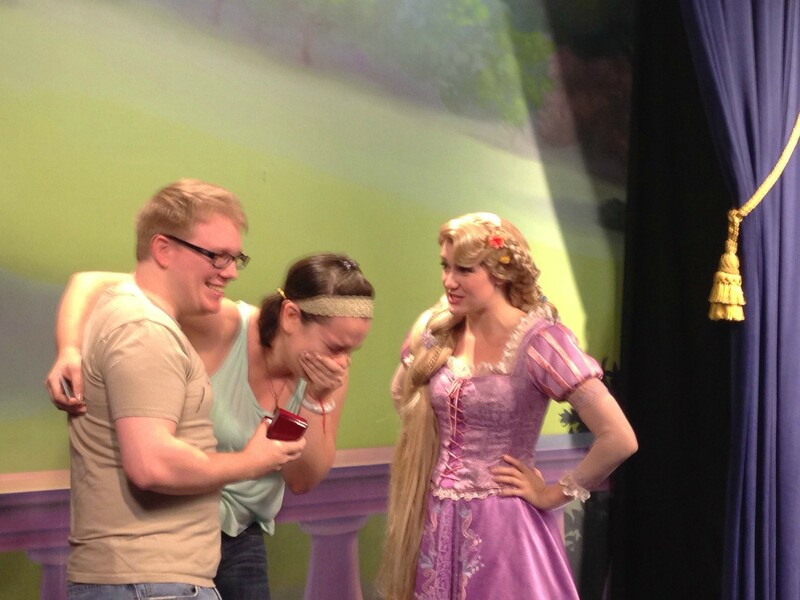 Dan sends me ahead to get my picture done with just Rapunzel. She's delightful. We joke and talk about hair accessories per the usual, but Dan is nowhere in sight. Cameras are clicking left and right, and my three other travel companions are on their knees behind the Photopass photographer. Things start to get blurry. I held up my hands to Rapunzel and said, "I'm really sorry, I have to stop you for a second. Something is about to happen and I don't know what." A cast member who must have been in on everything ushered Dan to us. He looked at Rapunzel and said, "I'm really sorry to interrupt a royal conversation, but could I ask you a question?" Rapunzel encourages him to continue. He asks, "Do you remember how important you felt when Flynn climbed a tower for you?" She nods enthusiastically. She's clearly more in on it than I am, and my knees are starting to go weak. "Well, Princess. This is MY princess, and this is the girl I would climb a tower for." He got on one knee, held out a ring box and asked, "Will you be my Rapunzel?" I sobbed. I was full on shaking. A little girl in the back screamed, "THEY'RE GETTING MARRIED." Belle and Cinderella watched the whole thing, and it was the quietest moment I've ever, EVER had at Disney World. Of course I said yes, Rapunzel started jumping up and down and crying, gave us a gigantic hug and then started giving me advice on walking with a long veil and how to decorate a kingdom. The other princesses congratulated us, the CMs all gave us hugs, and I joined an exclusive club of Disney World engagements. The rest of the trip was amazing for a lot of different reasons, but it was the most amazing moment of my life. Rapunzel was SO enthusiastic and so engaged (no pun intended) in the moment and making it special for us, and whatever the Cast Member did to hide Dan from me for a few minutes was incredible. He wanted to do it the night before when we were in costume but he couldn't track down Rapunzel to make it happen -- he had been hiding the ring in the satchel the entire day before, and was so scared I'd find it before we got to see Rapunzel together. EVERYONE was in on it, including our entire families and a group of people at our place of employment who were texted in real time with updates. I NEVER expected it to happen like this. It was beyond perfection. So, that's the story of my engagement and why Tangled is the most important movie in my life. It was the first movie we saw together, and now our whole wedding is Tangled themed. (There will be another thread for all that.) We see so much of ourselves in Flynn and Rapunzel and it will always have a very special place in our hearts. Dan announces that the ring is comprised of my grandmother's diamond from her engagement ring, and modeled after hers. I started sobbing again and Rapunzel asks if he stole it. This is the video of the engagement I edited for our family for Christmas. Ron took the video on an iPhone and it ends very abruptly, but it's what we used to announce our wedding date and venue, and my Queen Mommy still cries every time she watches it. Omg the most sweetest thing!!!!!! Look at you!!!!! Awwwwww thank you for sharing such a magical story princess. Made me beam with a big grin!!!!!! For the record....I am not an emotiinalc person...but I sit here in tears. Great job by your wonderful man. And so beautiful. Congrats. I remember one year my family was going through a bit of a rough time, financially that is. My mom was telling us that we might not have much of a Christmas that year because money was tight and she didn't want to get our hopes up. Well my grandma and I decided to craft that year to make the holidays just as special as they've always been and we sewed hand made stockings, and crafted these horse head candy cane holders you could put on the tree, and made stylish toilet paper holders as well as all these other little crafts. I got my little sisters to help make ornaments out of egg cartons and we painted them and made them our own and my family was having a blast just by making Christmas so to speak. Me and a couple of my sisters where in this Christmas musical that year so we'd dance and sing for my grandma and my third youngest sister was so happy because she was a little lamb for the musical and proudly modeled the sheep costume my grandmother had sewn for her. She even would wear it to bed through out most of December. I just remember how special that Christmas was for me because of the being together and trying to make it something special on our own for my little sisters. I knew how much they were looking forward to Christmas and prayed that they would not be too disappointed when they woke up to not find much under the tree. Well Christmas morning arrives and my family was given this big brown box that said Jesus loves you. They open it and inside are gifts for my whole family. My church had gotten together and got us all gifts to make our Christmas special. I was so blown away because it felt so wonderful to know that other people had thought about us and cared enough to try to make us feel special on Christmas. That Christmas was also one of the reasons I like to give to others and volunteer where ever and when ever I can as much as I can. That Christmas was one of my happiest moments growing up as kid. And I just wanted to say J'amie that that was the most perfect engagement story I have ever heard and was so wonderful beautiful and made my heart all a flutter. I just wanted to say congrats on your upcoming nuptials and that you and your future hubby to be are so lucky to have one another and to have such an amazing love. You guys are one of the cutest couples ever!! Right there with Flynn and Rapunzel I wish you both the best and a life time of happiness. i just want people to be happy. it was march 2nd 2010 if im correct,Jordan was 2 going on 3 in just 1 day. For his birthday the year before I had bought him a little red Specialized mountain bike with training wheels (mommy has a big red mountain bike, we matched) he loved his bike, he would ride it all over the place, and after a while had mastered it so well he had become a little speed demon, riding that little bike as fast as he could. It became clear it was time to take the training wheels off, they were now holding him back. With a little resistance from Jordan and a few tears I removed them, his dad did not agree with what I was doing, "it's too soon", "he's still too little"!! Jordan told me he was scared. I put his helmet on and took him around the yard and sidewalk for a few laps, but it was apparent, that was not going to work, turning and the thick grass was making it harder for him to get his balance, he was frustrated, I let go for a second but he had to turn after I let him go and he crashed a bit hard and cried and went into the house, I followed him in where I received lots of negativity from his dad, " I told you"! he said! I hugged Jordan and said everything would be okay and sorry he crashed and we'll try again later, but Jordan didn't want too! By now the day was ending and big dark grey clouds had moved in, rain was coming and it was obvious! but I really didn't want to give up that day, tomorrow was his birthday and I didn't want to leave him feeling negitive about the bike. Across the street there is an old shopping center with hardly any buisnesses, and a big, big empty parking lot!! (why did I not think about this earlier) and a thrift store. I told Jordan " lets go see whats in the Thrift store today before it rains" I grabbed his helmet and his bike, he started to cry again and was shouting scared "no mommy! no, no, no! I don't want too" I calmed him and said I promise I will not let you fall again, he really didn't want too but he loves the Thrift store goodies he finds so he took my hand. We got across the street into the parking lot and I put the helmet on his head and he got on his bike. I walked next to him as he pedaled, I have a back issue and im really tall 6'1 so bending down holding the bike is not a good idea, the best place I could hold him was around his neck, so I was gently holding his neck and walking next to him, and it seemed to help keep his balance and was working. as we walked/rode to the store I would release his neck but kept my hand there in case he began to tip, then I could re-balance him. At one point I let go and he kept his balance long enough that I could put my hand to my side. I walked next to him, but closer to the front of his bike, he looked at me and I looked at him and told him "your doing it Jordan" but it was short lived he tipped, I caught him. by now we've made it into the store, so we wandered through the isles of treasures, but did'nt find a thing, and it was starting to sprinkle outside so I told him we needed to leave. As we walked/rode back I did the same thing held his neck and released, then I just said to myself, I need to just let him go, so I did, he was riding and I stayed silent as we rode across the lot, then I stopped walking and he had not noticed as he pedaled away and I just watched. Finally he realized I was not by his side and stopped, he looked looked back and saw me and I was grinning ear to ear! "you did it pumkin" I was jumping up and down cheering and cheering, he got back on his bike and rode over to me! I hugged him and was cheering " I love you pumpkin, and im so proud of you!" "now try to turn" I told him, so he got back on his bike like he had been riding since he was born, lol, and rode in a big circle, oh and the sprikling I told you about, it was now raining! and there we were out in the rain, Jordan riding his bike me jumping and cheering and getting all teary. We were soaked and having the greatest moment ever! in just 30 minutes my son went from training wheels to none and was riding like a pro! The greatest gift ever! and it was his birthday not mine. The next morning was his 3rd birthday, we packed our bags and headed to DL to celebrate his big day, we made reservations to celebrate with Mickey and decorate little mickey cakes, but what topped that birthday cake was the evening before, as he pedaled his little heart out in the rain for the first time without the training wheels and I've never been prouder. oh i love all these stories! they are making me feel all fuzzy!!!!!!! !